Feel free to adjust the size you need, and the rotating wheels carry objects that allow large furniture or washing machines and household appliances to move quickly and easily on any smooth floor. When you want the cart to remain stationary, turn the screw against the ground to ensure that the cart does not move accidentally. Made of stainless steel and high-strength plastic, it has a load-bearing capacity of 300-600 kg and is stable and easy to assemble. The rotating screw adjusts the height and height, and when the ground is not flat, it can be adjusted by one foot to reach the desired level. Length, width, height can be adjusted to meet the washing machine, dryer, refrigerator, air conditioning base size. The multi-leg support is stable and can be safely fixed. The horizontal device is embedded to prevent the washing machine from shaking. Easy to install, it only takes five minutes to install. 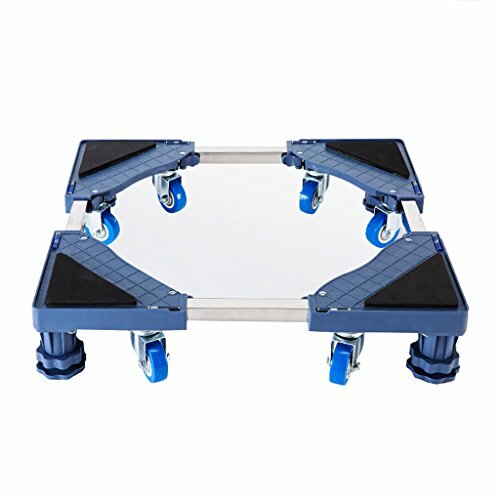 ★ stainless steel, anti-corrosion, rust-proof, moisture-proof, leak-proof, sturdy, durable, adjustable size, super rigid, resistant to punching, stable base, easy to clean up dust, removable, multi-foot support, non-slip rubber mat. ★Rubber rotating wheels allow large furniture or washing machines and household appliances to move quickly and easily, and the fixed feet can be fixed in a fixed direction. ★ 2 styles, embedded horizontal device, make the support more stable, prevent sway, no noise, no scratching the floor.